If you've jailbroken your iPad or iPad mini, there's lots of apps and tweaks available that can not only make using your iPad much more enjoyable, but enhance core iOS features and make them a lot better. It's not uncommon for Apple to implement jailbreak ideas and concepts in future versions of iOS, but why wait when you can have them now? There's lots of jailbreak tweaks and apps available in Cydia and weeding through them all can be a task. We've already told you our favorite jailbreak apps for iPhone and these are our favorites for the iPad and iPad mini. 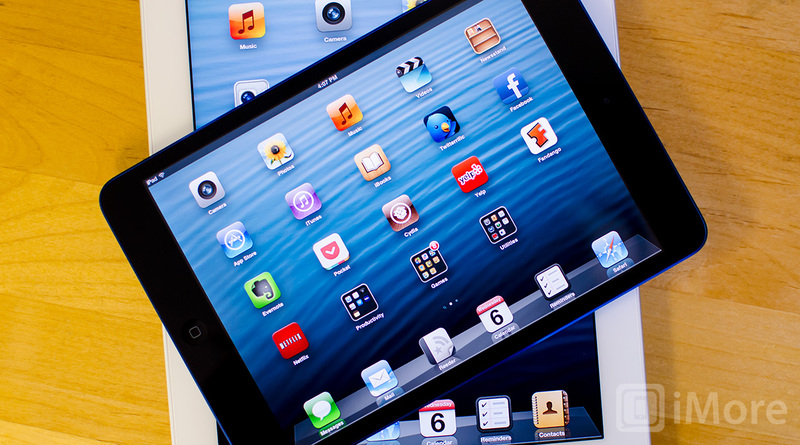 Tapping into Settings every time you want to enable or disable WiFi or change your iPad's brightness can get irritating. NCSettings adds quick toggles to Notification Center to quickly access settings such as brightness, WiFi, cellular data, and more. There are lots of add-ons to be had in Cydia as well. If you've ever used SBSettings in the past, you'll be right at home with NCSettings. The only difference is that NCSettings just integrates with the already existing Notification Center interface which means less gestures to remember and more information and functionality all in one place. 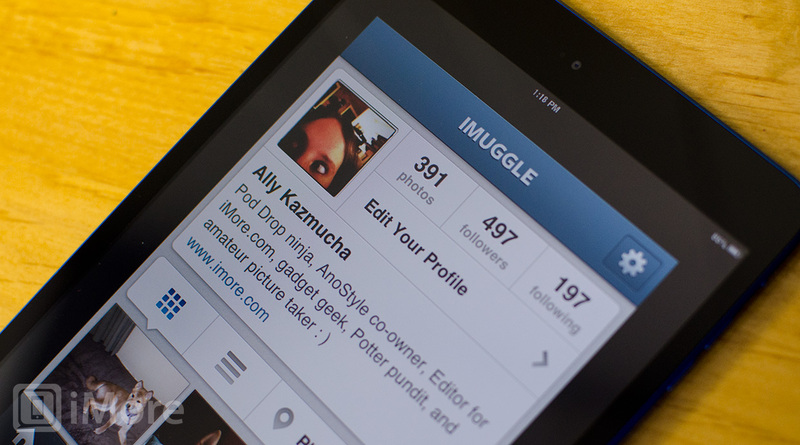 There are lots of apps out there that are for iPhone only. While Apple will allow you to download them on your iPad, they're tiny and when you expand them to 2x to fill the screen, they're grainy and look like crap. This is where RetinaPad comes in handy. Once you've installed RetinaPad it'll automatically detect any traditional iPhone app that you open on your iPad and automatically upscale it to not look like crap. While it doesn't completely fill all of the screen like a native iPad app would, it makes it look a heck of a lot better and a lot more bearable. 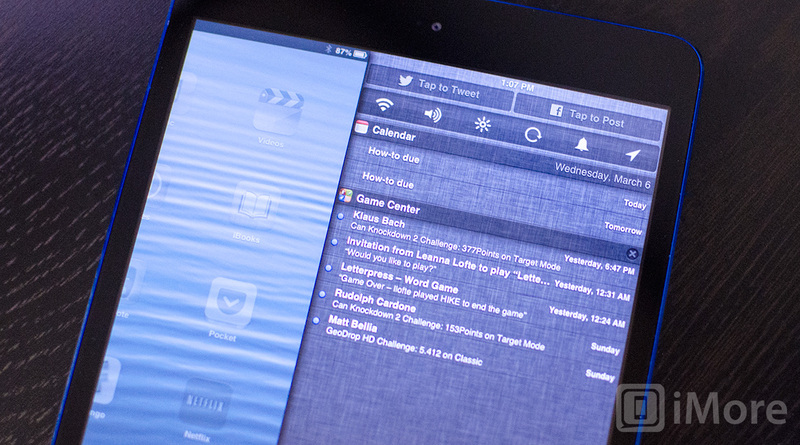 If you've got iPhone only apps that you really want to run on your iPad, RetinaPad is a must. If you've got a Mac running OS X Mountain Lion, you're probably familiar with the way Notification Center works on it. 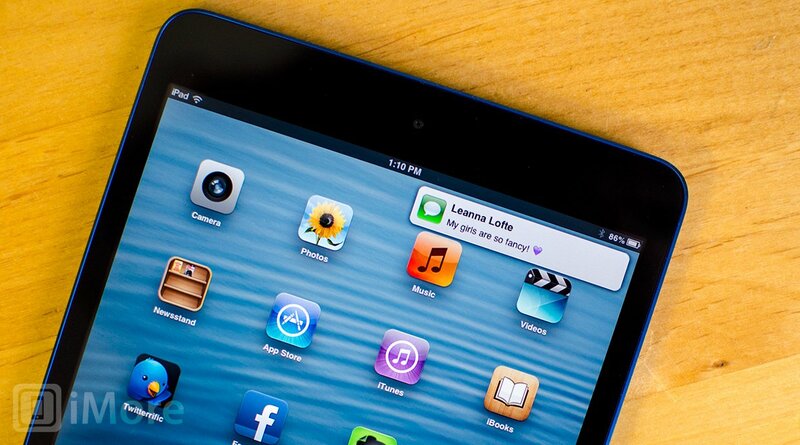 While this method isn't really viable on a screen as tiny as the iPhone, it is on the iPad or iPad mini. I've never been a fan of how Notification Center pulls down on the iPad. It's almost as if they took the default iPhone Notification Center layout and stuck it on the iPad. It's not customized for the iPad and just feels like a cheap port. MountainCenter gives you the same kind of experience on your iPad or iPad mini that you get on your Mac with Notification Center. Simply pop into Settings and set up a gesture to trigger MountainCenter and you're good to go. 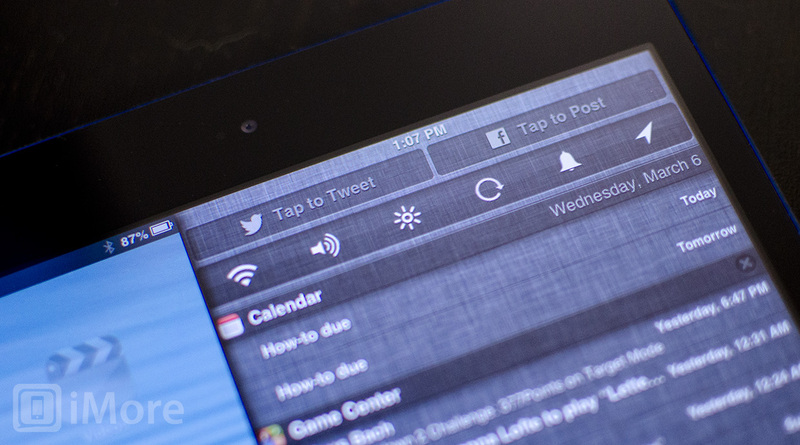 Slide to the right or left to reveal Notification Center on the side just like you can in Mountain Lion. It just feels better than the default implementation of Notification Center for the iPad. Not to mention you'll be able to see more data at a glance than the default provides. Just like Notification Center feels half baked, so does the default way notification banners are shown on the iPad and iPad mini. While they span the entire length of the top of the screen for iPhone, they don't on the iPad and again, feels like a super cheap port. It works on the iPhone but doesn't fair so well on the iPad or iPad mini. While you could always wait for Apple to make improvements to banner notifications on the iPad, you can also download Emblem which solves the problem right now. Instead of seeing the stock banners that don't look so great on the iPad to begin with, Emblem turns notification alerts on the iPad into OS X and growl like banners that will show on the upper right hand side of the screen. Tapping on one will launch the program the notification was received from. If you receive more than 3 notifications, Emblem will combine them into stacks that you can scroll through instead of taking up half the screen with banners. If you don't take any action on a banner, it will simply roll away just like stock notification banners would. While the iPad can be a great business tool, the keyboard still needs some work. Typing on it, especially when you make errors, can be daunting and slow at times unless you're using a keyboard accessory. Even that can still be annoying when reaching for the screen to correct errors or add content. 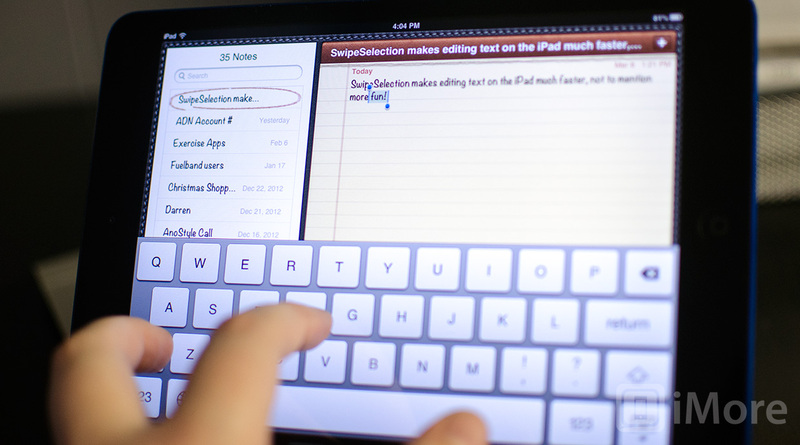 SwipeSelection aims to solve these problems by adding some additional functionality to the virtual keyboard. For example, instead of using your finger to move cursor around with the magnifying glass, SwipeSelection simply lets you drag your finger back and forth or up and down on the actual keyboard to move the cursor position. It doesn't seem like a big deal but when correcting and editing text, it's loads faster than moving your finger all the way to the top of the screen again. Another really nice action happens when you hold down shift and drag your finger. You'll notice that this highlights the selection of text that you are dragging over. It's much more natural than double tapping the screen or tapping and then dragging a cursor around. Your fingers are already on the keyboard, why not keep them there? While these are our very favorite apps that we think really will enhance your iPad experience, everyone uses their iPad for different reasons. We are sure all of you have come across some pretty awesome tweaks that rank in your top 5. Share them below in the comments!